Digi-Schlock: SOUTH OF HEAVEN (Synapse DVD) – Schlockmania! Hundreds of films see video release every year but even more never make it to any kind of release. This is especially true for the independent film market, where countless films languish without ever making it to an audience. Thankfully, there are video labels that are willing to experiment with smaller films. Synapse Films is a noteworthy example and has really expanded its reach in the last few years to take in this kind of cinematic orphan. South Of Heaven is their latest release in this vein – and they’ve given it the same kind of loving care that their better known genre releases receive. 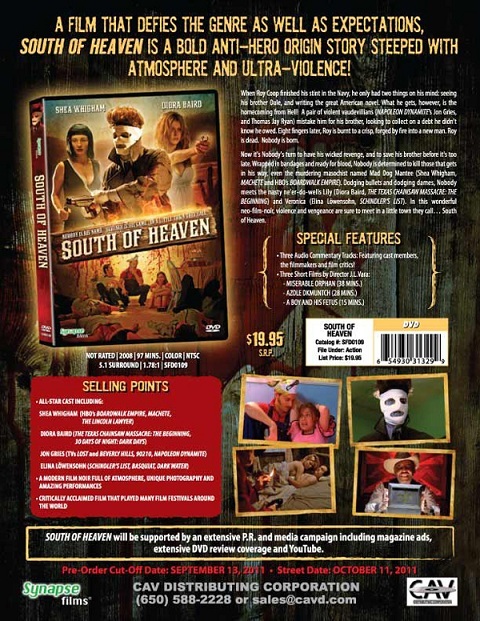 South Of Heaven is skillfully shot for a low-budget indie and Synapse’s DVD does justice to its unique look, which offers a unique blend of shadowy interiors and attention-getting primary colors. The anamorphic image is free of debris and looks quite crisp. Equal attention has been given to the audio area, with 2.0 and 5.1 stereo mixes. The 5.1 mix was listened to for this review: its blend of elements is clear and it makes strong use of Russ Howard III’s richly-textured musical score. Extras are also plentiful on this disc. For starters, there is a whopping three(!) commentary tracks on this disc. 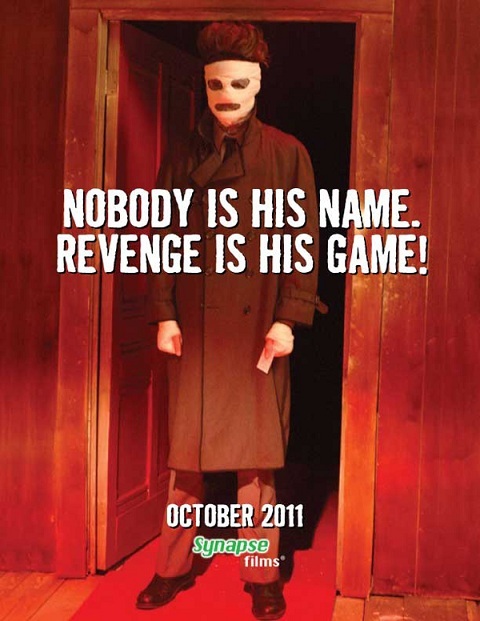 The first is a filmmaker commentary that includes writer/director J.L. Vara, cinematographer Darren Genet and producers Brian Udovitch and Jason Polstein. Vara takes the lead from the get-go and leads the listener through a fast-paced stream of comments that outline the many influences he incorporated into his script and visuals. The others do a fine job of backing him up, outlining the on-a-shoestring nature of how the production was assembled and the many tricks involved in making the film look bigger than it is. There is also a lot of praise for Shea Whigham’s acting chops and dedication to his role. The cast commentary features Adam & Aaron Nee, Shea Whigham and Jonathan Gries. Everyone has something worthwhile to offer here as the quartet discusses the intense level of dedication the film’s dialogue and characterizations required, with each effectively conveying the choices they made to make it work onscreen and the dedication required to pull it off. Gries in particular is a fun storyteller, with some amusing stories about his interplay offscreen with onscreen partner Thomas Jay Ryan. The final commentary features a trio of film critics: Devin Faraci from Badass Digest, Scott Weinberg from Fearnet and Todd Brown from Twitch. Sadly, it doesn’t have much to offer. Critical commentaries work best when the film is a classic that can be researched or pair the critic with the filmmaker. The critics on this commentary are enthusiastic about the film and offer some interesting commentary early on but they run out of material after 30 minutes. They also commit a pretty embarrassing gaffe when they misidentify actress Elina Lowensohn and question why she used a “strange” accent (it’s her real accent and she’s a fairly prolific indie and foreign film actress). The rest of the track devolves into padding, including griping about unappreciative readers and making boobie jokes. There is one interesting story about how a particular Smiths song was licensed for the film near the end but it’s a bit of a slog to get there. The remaining extras are three of Vara’s student films: Miserable Orphan, Azole Dkmuntch and A Boy And His Fetus. These are pretty tough to sit through, by design: they are self-consciously artsy, dark to the point of morbid, more than a little pretentious and astringent in both storyline and technique. They also tend to be overlong, lacking the narrative economy Vara would bring to his first feature. That said, anyone who loves the main feature will find them of archival interest as they represent Vara’s early work with collaborators who would be important to South Of Heaven, particularly the Nee brothers. To sum up, this is a surprisingly deluxe edition for such a small film and Synapse deserves kudos for giving this uncompromising film such a professional treatment. 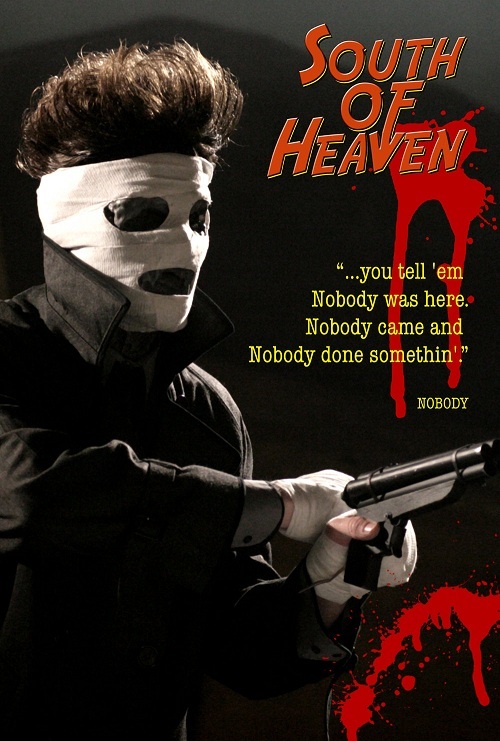 If your taste extends to edgy indie fare, South Of Heaven is worth a look.